Move over Maton. I’ve got another obsession now. Recently my Maton obsession has subsided a little. Partly this is due to the Maton book I’m working on, as I realise there’s no point buying/trading everything that moves with an old Maton logo… as there’s always someone else out there with more than you. So my collection over the last 12 months has been refined to guitars I want to have, not need to have. A lot of guitars I’ve featured on this blog have moved on to new owners. 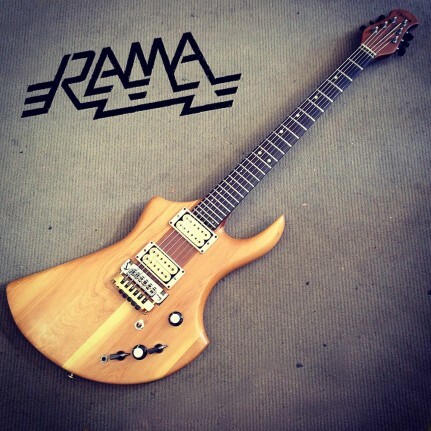 All that means though is that my attentions have been diverted to a new obsession… Rama Guitars. A guitar company so obscure that the only info I could find on them was a lot of second hand accounts (“oh yeah… I think my bass player had one”) and nothing else. I first came across Rama in a post on the Aussie Gear Heads forum. 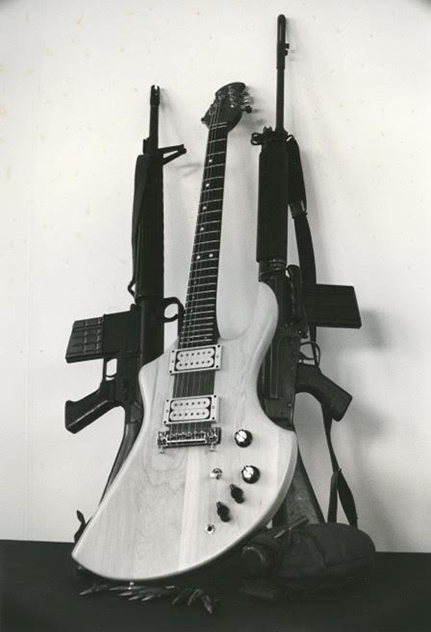 Someone had posted a photo of a cool SG-type guitar looking for more info. 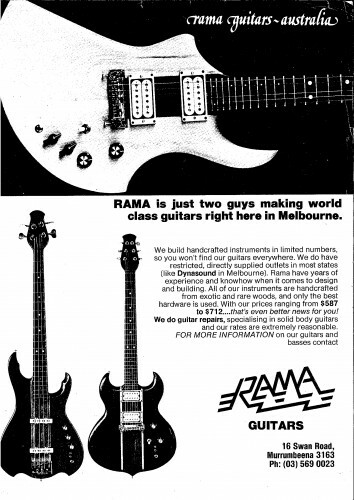 A few people piped up and said that Rama Guitars was started by “two guys called Barry & Leo, both ex-Maton”. Someone then uploaded an old badly scanned magazine ad that someone had collected back in the day from the Journal of Australian Music (JAMM) magazine. It featured an absolutely stunning BC Rich looking guitar. Another was a pretty intriguing left handed white SG with a very Maton Wedgtail style recessed Bigsby which sold very quickly. I was devastated it was a lefty. And the last was the fabled Rama Explorer that I had coveted years before. I ummed and aahed about the guitar for over a year as the price was a little high for my tastes for a guitar I didn’t know much about. 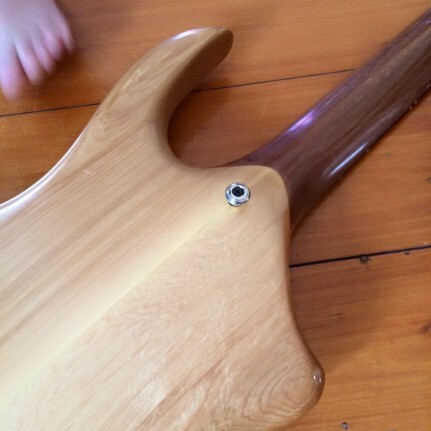 Then out of the blue I had a look at that badly scanned magazine ad and I noticed from the visible woodgrain that it was the EXACT same guitar that featured in the ad! To me that made it a bit more special and I became more interested. 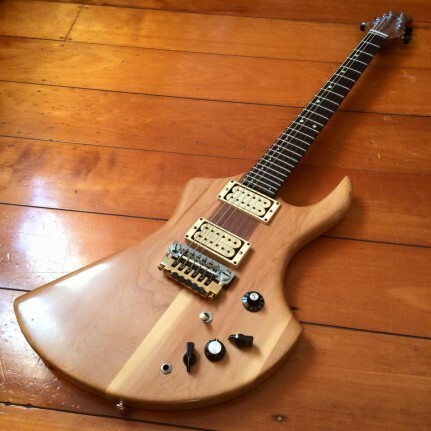 The SG had sold for a reasonable amount so I thought I’d put in a similar offer for the Explorer. The owner agreed and after 5 years, the guitar was finally mine! Hi there, my name is Leon Bronson and I am a part of the RAMA GUITARS story. 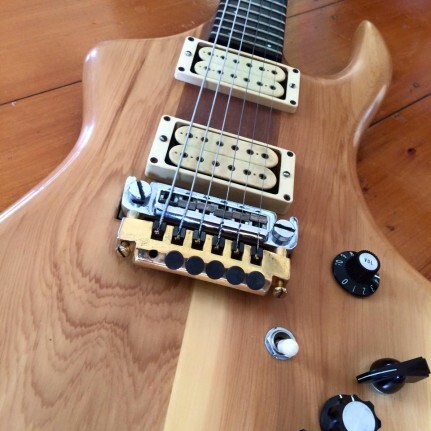 Back in the Late 1970’s Barry Cowen was a leading-hand at MATON GUITARS, in the Melbourne suburb of Canterbury. Having worked there for 16-years, Barry had a wealth of experience, know-how and was a hands-on crafts-person. He had long-service leave due to him and a desire to make stylishly crafted electric guitars – it was the perfect opportunity to go for it . Barry and I were already friends and one day he asked me if he could start making guitars in our ‘mostly unused’ garage. My wife, Christine, and I were fine about it – and so the setting-up began. I think none of us knew where this was going. Back in the 70’s tools and machinery were expensive – not like now with cheap imports. Barry new what was required to get things up and running. I was a natural at sourcing things on the phone, engaging with equipment suppliers and retailers and had a keen desire to be somehow involved – so together we made up a team. 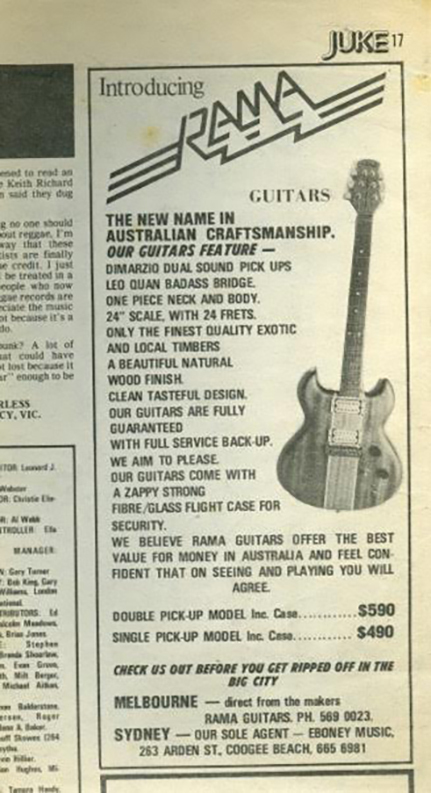 In January 1978 the business name RAMA GUITARS was registered. You also have to remember that this was a time before modern PCs – and the internet hadn’t appeared. So everything took more time and effort to research and come together. After a few sometimes frustrating months, Barry had purchased all of the tools and machinery, as well as made the jigs required. We had also decked-out my old fibro-cement garage and a shed. One was for guitar construction and the other as a spray-booth and for case-making. The first guitars were born. 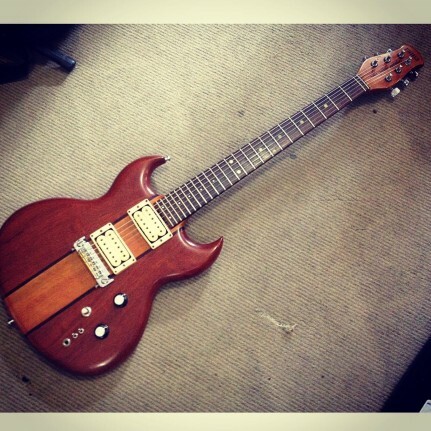 The late Matt Sanford of Flying Colours, a very talented young player (who had also worked at MATON), purchased the very first completed SG style guitar – he loved it and made it rock! 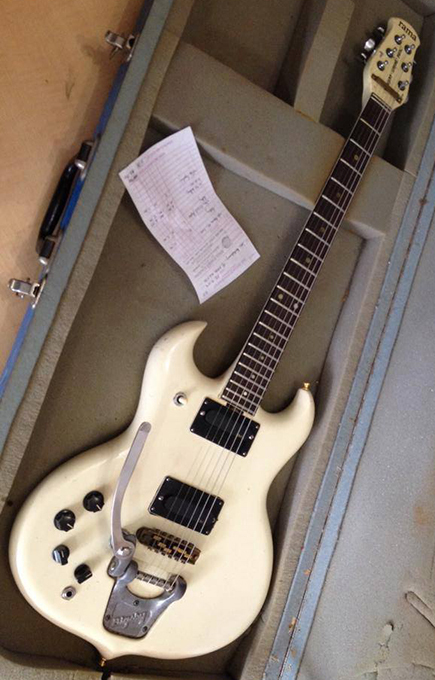 All RAMA GUITARS SG and ANGEL guitars had a 24” (two foot) scale and were fitted with a zero-fret. This zero-fret replaced a conventional nut – and gave a more natural open-sting sound – this concept made a lot of sense. A ‘no compromise’ approach to construction was adopted by Barry – top-of-the-line hardware was selected – DIMARZIO dual-sound pick-ups (or on request, BILL LAWRENCE pick-ups), SCHALLER mini machine-heads and BADASS bridges. 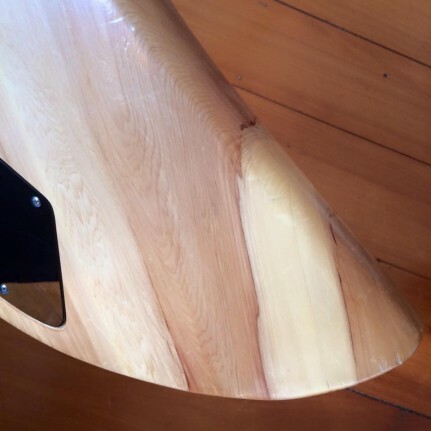 The woods used in the necks were either Tasmanian Myrtle Beech – with Indian Rosewood on the fingerboards. In the bodies we used African, or Brazilian Mahogany, or very old Tasmanian Celery-Top Pine (just the ANGEL model featuring that blonde, natural wood, finish). 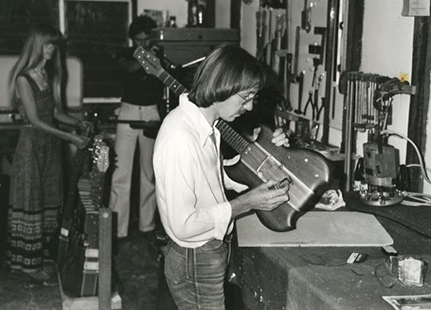 After the final design of the SG model and bass guitar were finalised, the bodies were generally made & sprayed five at a time – then finished-off on demand. This was the best way to be cost-effective and manufacture on a small scale. 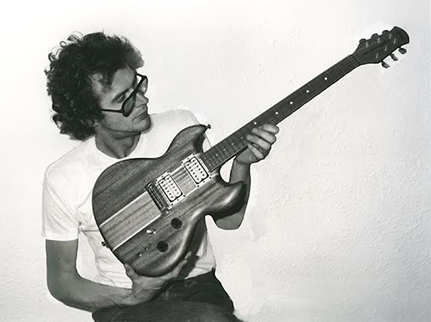 Barry could produce only one hand-made guitar a week. 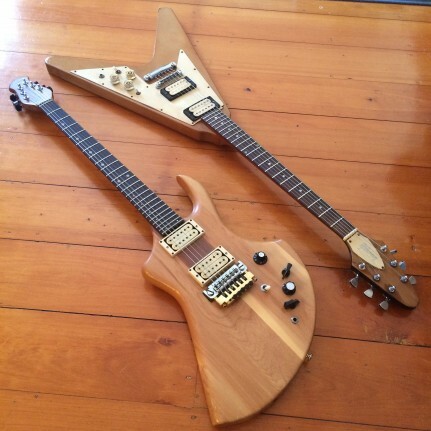 These hand-crafted guitars were aimed to be ‘affordable’ – at prices around $414 through to $750, at that time. For me, being involved with Barry and RAMA GUITARS was a creative side-line. Barry did all of the guitar design, crafting, spraying and final assembly. I had a basic knowledge of electronics – so I did all of the pick-up/switching wiring. I also designed logos, did artwork and copy for advertisements and hand screen-printed all of the head-pieces, with the RAMA GUTARS insignia. My hardworking wife, Christine, and I also made the brightly coloured fibre-glass flight-cases that I designed. This was a thing that we tired of after a while – due it’s messiness, health reasons and the irritation we experienced in working with fibreglass. Even as props for Robert Palmer’s hot backing dances. It was great for Barry, Christine and I to see the guitars on the nation’s premier pop music show. I managed to get the guitars into DYNASOUND – a then very prominent music store, right in the main street of Melbourne. A little later we also had a Sydney outlet, EBONY MUSIC – but that store was not able to move a single guitar. This was very disappointing for us, as we had expected much better results from this boutique guitar shop. It was always a battle to actually compete with American iconic brands that had status. Our only advertisements were in TAG, JUKE, or JAMM – the only popular music magazines at the time. Occasionally we would get responses and deal directly with guitarists. There was kudos in knowing that Rodger Hart of Little Heroes had won the Battle of the Bands using one of our SG style guitars. Even Split Enz bass player had a RAMA. And in a recording session their producer liked the sound of a RAMA bass over both a GIBSON and a FENDER. We also lent guitars to artists so they could try them – Ian Moss, Ross Wilson, Ross Hannaford and more. I think it was FESTIVAL RECORDS who commissioned a guitar in the shape of Australia (complete with a separate small piece in the shape of Tasmania) as a TV prize for an album promotion. There were numerous other good guitarists who loved these instruments – and over time we met many enthusiastic, eccentric, gifted and pedantic players. Over about a two year period Barry produced almost 90 fine instruments. Many live on I am sure. 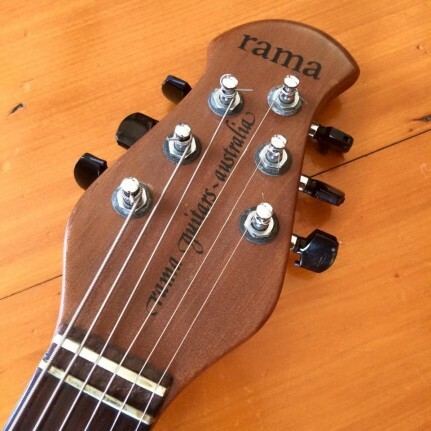 So what happened to RAMA GUITARS? After a further 10-years with the ABC television (and other side ventures), I then went out on my own in the early 90’s. I saw an opportunity and started Bronson Video production Hire - renting equipment to freelance camera operators, production firms and television stations. This lead to also starting a boutique video editing facility; and to then becoming a director/producer as well. I have now retired. And as for Barry, well after a couple of years of manufacture he found it was just too difficult financially to continue with RAMA GUITARS. He moved on to a position as the guitar technician for TROY MUSIC, at their South Yarra store. The income was regular and he was meeting and engaging with a larger number of players – many very well known and some international artists. Today Barry still puts in two days a week at FIVE STAR MUSIC in the Melbourne outer suburb of Ringwood. So after a lifetime of guitar crafting, repairing, modifying, set-ups and sales, Barry is still a part of the music scene – and loves it! Importantly, Barry and I are still good friends. I received my Rama “Angel” and after chatting to Barry discovered it was the only one made with this wood as it was so rare, and only two Angels were made… Barry owning the other one which is Mahogany. I was also shocked to discover the tree that was used to make my guitar was over 3,000 years old! That means this tree was already around 500 years old when Julius Caesar & Cleopatra were alive. That certainly qualifies it as a vintage guitar. I am honestly in love with this guitar. For one thing it’s got that Neil Moser-era BC Rich vibe which I’m a huge fan of, and it’s also unique and such a beautiful design. Plus the workmanship is stunning. The neck shape is reminiscent of the narrow/deep 70′s Gibson SG, but with a delicious (slight) V profile. Plus the edges are beautifully rolled so it’s easy as butter to play. 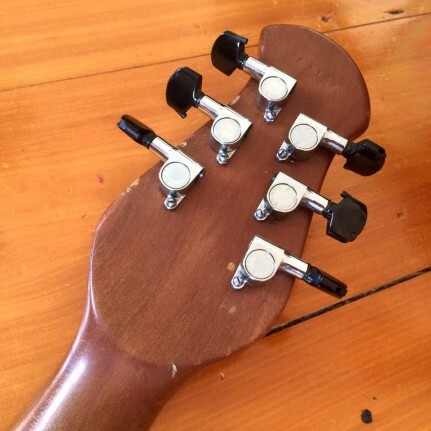 And the neck thru design is fantastic… you can easily hit the 24th fret without thinking. The headstock shape is slightly different to the regular Rama SG’s and as mentioned features those mini Schaller tuners with the pull-out winders and Leon’s hand screenprinted artwork. 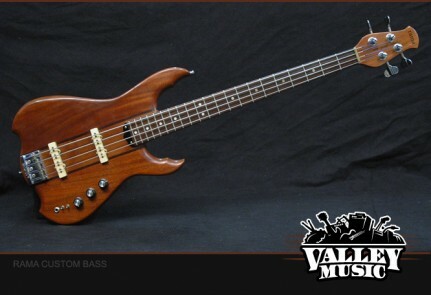 There’s also a very 70′s volute plus a zero fret, which reminds me of Barry’s work with the Maton JB6. The back of the guitar features some beautiful grain, and I still have to kick myself when I think how old this wood is. The guitar came equipped with 12′s, which is very handy as it’s instantly gone into service in my C# tuned band. The feeling of playing a totally hand built, one of a kind vintage guitar is so satisfying. It’s everything guitarnerd is about… to discover these less known classics and document them. My next task is to find a Rama SG and also one of the Rama basses. It took me 5 years to get the “Angel” but I’m patient. Two of them turned up at once at my friend Adam Cole’s shop, so hopefully I score one someday. A massive thanks to Leon and Barry for taking the time to talk to me. These have become my new obsession! They really are a hidden gem, so if you come across one… give it a go and appreciate the amazing workmanship. And if anyone out there owns a Rama, please share the story of your guitar here! Great article, Tony. Leon’s contribution is fascinating. I have been looking for a quality guitar with the 24-inch scale. Do you have any comments about playability, comfort, string gauges and other factors? I use to play a Rama bass for years. I bought it in the early 80′s and finally sold it in 1996/67. It was fretless originally but I ended up getting it fretted in the mid 90s. I put a custom, black perspex scratch guard on it. If you ever see it you will know it was mine. It was a beautiful instrument and I traded a Gibson for it (I think I got the better part of the deal). I never played any other instrument whilst I had it. It was perfect. Sensational article and thanks so much for posting it. Matt Sanford mentioned in the article was a very dear friend of mine and it was because of him I bought my custom ordered Rama which I still have to this day. It’s a lefty, was based on a cross between the SG style and my beloved start and had an old pair of Gibson Mini Humbuckers. Great article, love reading about small “unknown” guitar makers. 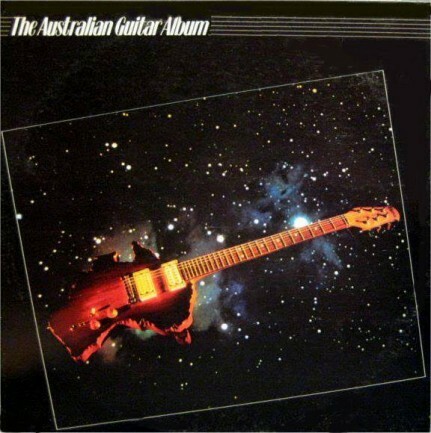 Any one know whatever happened to the “Australia” shaped RAMA from the Australian Guitar Album cover? Is it still in existence? And I was the one at Dynasound that sold these lovely beasts. I think an old mate still has his celery top pine Angel. ( may have been in sympathy for its creator). I will play her again one day, can’t wait. Was excited to find this article and learn about her history. I came across a RAMA bass back in 2003. I was working for the Salvos, in which we had a recording studio being used for community focused music programs. I was borrowing a Maton JB4 for bass tracks, but on the look out for a secondhand Maton to own. I had a guy come through the studio who had no cash but needed a hot water service installed. I’m a licenced sparky so was happy to help out. During a conversation at his house he pulled out the Rama Bass, and said. Have it. I cant pay you for the electrical work, but have the bass. It owes me nothing and you have a need. I thought, gees, it looks odd, but the weight and running gear seem to be the go. I said no, but he insisted. Well. What a Bass. No need for the JB 4. Sounded amazing. I contacted the guy again and offered to buy it, cause it sounded like an expensive bass guitar. But again he said. No mate. He paid $200 for it and the electrical work to him was worth heaps more. Deal done, and l still have the bass today. I’m a keyboard player and hack bass player. But everyone who plays the bass loves it, abet the look!. In 2008 l was part owner of a music shop, in which we we always trading and selling second hand guitars. I actually always had the Rama hanging up in the shop (to try and get some info out of people). One morning our guitar tech was doing a sell on a Fender Squire Bullet. Yep a $199 electric for an old fella who wanted to learn. After about 60 mins, the old fellas said yep, l’ll have one of them in red please, and can l trade in?. The tech asks me if we’d be interested, and l said of course, but thought hard considering it was only a $199 guitar. Anyway the old fella bought in the guitar in a newish case. Our tech opened it up, and started laughing his head off. “Dave, get over here” he said. I couldn’t believe it. A SG style Rama. Anyway. After filling the old fella in with the Rama Bass story and not knowing what they are worth, l said l’d buy it and he could have the Fender Bullet. He says no mate. I bought this thing up the bush for $5 and l dont like it. Give me 50 bucks off the Bullet and l’m stoked he said. Again, l didnt want to rip him off, plus l had no idea what the thing was worth, so the deal was, l swapped him. He got a new bullet and l got a matching Rama for the Bass. The old fella so happy. They are both in great condition and people love playing them. Thanks for doing all the research. I had the odd rep come in the shop and say little snippets of the Rama legend but nothing black and white. I guess they are collectible in some way. At least they have a good story behind them and are quality instruments. I can take some pictures if you like. I own a Rama bass which I bought directly from Leon as I also worked at the ABC. It’s a beautiful guitar but seldom played and still in the original lurid blue fibreglass case. I am about to put it on the market as I need to unload some of my gear. I used to work at Maton across the bench from Barry who taught me the skills needed for the job. He was a great person to work with.